Portland, ME. 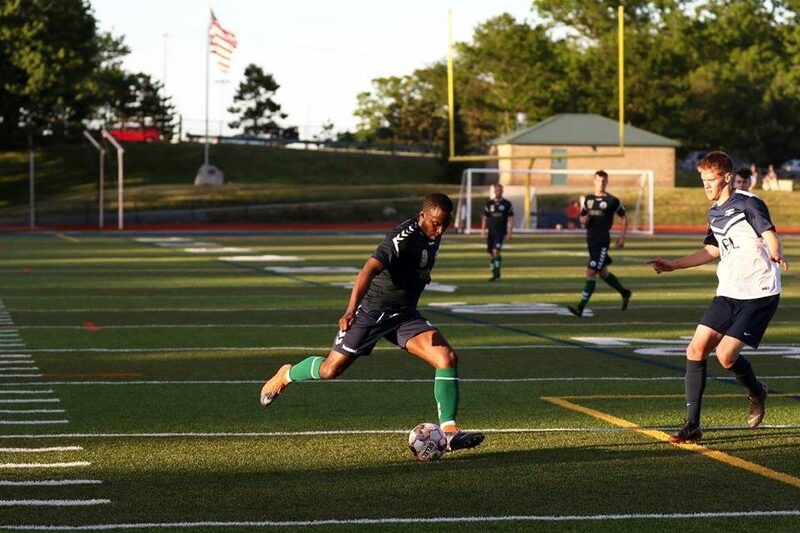 – Each week provides a new challenge within the NPSL, this week your Colts traveled to their farthest away fixture of 2018. Maine’s perennial soccer powerhouse, Seacoast United Mariners was the match up, a side that can never be overlooked. Hartford’s lineup featured some fresh faces in the starting group, Lamar Chancey (Meriden, CT), Rashawn Dally (Bloomfield, CT) and Quentin Lux (Plainville, CT) made their first career starts for the boys in Navy and Gold. From the beginning of the match, Hartford City looked to be in control, holding majority of possession while creating multiple chances. Seacoast deployed a very compact defensive structure, with a line of pressure starting at midfield and looking to counter Hartford whenever they could. Breaking down the Mariners didn’t come easy throughout the half, as space in the final third was typically filled with ten players. Patience eventually paid off as Ryan Taylor (South Windsor, CT), was able to gain some separation from his defender and finish an opportunity from the left side. In the second half, the Mariners maintained their defensive structure, attempting to prevent a second goal. Patience paid off yet again for Hartford as second half substitute, Riley Strassner (Avon, CT) was able to pull off a beautiful shot that found its way into the side netting, giving Hartford a 2-0 lead inside the final fifteen minutes of play. Hartford would maintain their two goal lead to seal the match. The result takes Hartford City FC to 4-0-0 on the season and sees them maintain their second place position in the table. The Colts remain just 3 points behind the league leading New York Cosmos, with a game in hand. Next week the Colts will again be on the road, facing Boston City FC in a rematch of last year’s instant classic, first round playoff game. Fans interested in traveling can make the trip to Brother Gilbert Stadium in Malden, MA or watch the live stream broadcast.